People come with all sorts of different personalities, and the people at Monkey in a Dryer Screen Printing want to help you show yours to the fullest. We not only have a wide array of t-shirt styles, but also a few tools to help you completely personalize your apparel. Contact us today to learn more about our ladies’ t-shirts. We are based in Hopkins, Minnesota, and proudly ship products to customers nationally and all over the world. Great for teams, groups and schools on a budget! Pre-shrunked and looks great! Comes in a huge assortment of colors! Available in Men’s, Women’s and Youth sizes. A flattering tee that genuinely matches your favorite collegiate and professional sports team colors. Pre-shrunked and looks great! 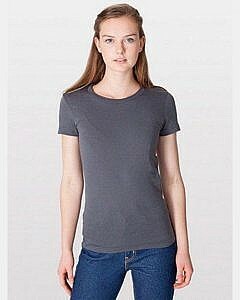 Lightweight and extra soft, this fashion forward tee has the look of perfection.